For those of you who follow my blog, you may have noticed that I also reviewed The Pacifier Part 1. I am grateful that I was able to read the first one, so I could follow along with this book. 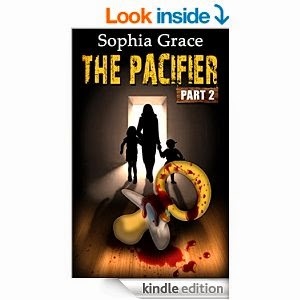 the Pacifier part 2 starts where part 1 stops. You could understand what was going on just by this book alone, but it is much easier when we know the background info. In part 1, we were introduced to all of the characters, and witnessed the kidnapping of the kids and the baby sitter. Following through the eyes of the kids/babysitter, parents, and the cops, you really get a good perspective of what is going on in all of their minds and their lives. We see a sneak peek of the kidnappers and the barn that they took them to as well. Part one ends with two possible escapes. Part 2, starts with both escapes. The babysitter, who thought she killed one of the kidnappers, and comes back to save the children, and Charlie, the youngest child, who escapes out the front door. They all have to show strength to get themselves out of the mess, they didn't create. They continue to show their ages throughout the book which got a tiny bit annoying. I did get into these characters, so every time something ended badly for one of them, I did feel for them. I was also excited when the babysitter and kids were found. I assumed there was going to be a happy ending, there is always a happy ending in the stories..nothing like real life. I guess though, that people would rather see a happy ending then a sad one. One thing I don't like about this series, is the fact that they are way too short. In some areas, there is great detail and you really get into the story. Other areas though, are brief and not explanatory at all. The ending is another thing that bothered me. It was way to abrupt. Ended in a happy way, but should have been extended to show the parents getting them back and life afterwards for everyone involved. It almost seems like the author had only been allowed to write x amount of pages so she had to squeeze it all in. It is a very good book and series. There are only a few flaws in it, which I have mentioned above. Otherwise, it is a good book and you will get into it. Doesn't take long to read as it is a short book, Pretty well written in spots. Just wish it wouldn't have ended the way it did. If they came out with more to this series, I would probably read those as well! If this book sounds like something you would enjoy, head on over to Amazon by clicking here. From there you can find out more about the book, see what other reviewers are saying about it, and buy a copy for yourself, for under $3.